Along the curved path of Woodstock Street near the corner of Durham Road, Byna Camden often cruises in her boat-sized, cream-colored Cadillac Eldorado as part of Green Acres radio patrol, keeping watch over the manicured lawns in this diverse, well-off neighborhood on Detroit’s Westside. To the east lives Shirley Burch, a long-time resident of Dequindre Street. Three blocks away is the street of her childhood, where a charred wooden skeleton of a two-story house sits atop a small plot of twigs and tumbleweeds, its shingles dangling from a sagging roof, the outer wall pried away from the gutter like a shoulder pulled out of its socket. Both women live on either side of the city along 8 Mile Road, the commercial thoroughfare that cuts across the state of Michigan and divides the city of Detroit from its northern suburbs. They have been here for more than four decades and remember the 20 mile stretch as it once was: a physical separation between the urban blacks and suburban whites; a social barrier to full integration; a psychological stifling of acceptance; a line etched in the sand separating two camps at war. The women say that today this line is blurred, that the wall to progress has started to crumble beneath the feet of a new generation. But for the Rust Belt city of Detroit—where affluent communities border blighted neighborhoods, where illiteracy pushes 50 percent, where the homicide rate ranks among the nation’s highest, and where residents continue to leave—hope may still be something just out of reach. Burch, 70, first moved to Lumpkin Street more than 40 years ago when her family left Alabama for Detroit. But the house Burch grew up in is now burned to the ground. 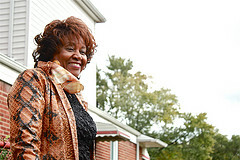 Shirley Burch in front of her home in Northeast Detroit. Photo by Chelsia Rose Marcius. Yet some Detroiters work to save shuttered homes like the one on Lumpkin. Tami Salisbury, executive director of the 8 Mile Boulevard Association, helps entice prospective contractors to break ground in this area. Such changes include repurposing abandoned manufacturing plants, cleaning up run-down parking lots, and brainstorming ways to use the barren land of Michigan’s former state fair, development that Salisbury said has brought integration to communities like Green Acres. 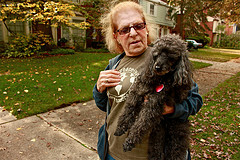 Camden, 81, moved to that neighborhood in her 20s when her mother left her home near downtown Detroit for the city’s northern edge. She said that her mother did not want her younger brother Andy to be the only white boy in an all black school. Byna Camden in front of her house with her poodle Bart in Green Acres, Detroit. Photo by Chelsia Rose Marcius. More development might mean greater integration is on the way. Greg Moots of the City Planning Commission said the Shoppes at Gateway Park—a mall complex that is five years in the works—looks to bring in customers from both sides of 8 Mile. Other efforts to foster improved relationships between city and suburban residents include beefing up regional transportation so that commuters can easily cross from one side of 8 Mile to the other. The Woodward Light Rail Project is integral to creating that link said Executive Director of Transportation Riders United Megan Owens. She said it could mean the eventual creation of a regional transportation authority and ultimately improved coordination of the suburban and urban public transit systems. But Burch and Camden are not among the apathetic in their community. As Burch left behind the ruined homes of Lumpkin Street, she pointed ahead toward a new housing development, bordered by a perimeter of bright white sidewalks and green tree lawns. Stepping out of the passenger door, Burch smiled up at a newly built row of brick facades near 8 Mile Road. I was expecting a comparison between someone who lived north of Eight Mile and one who lived south. Since that dividing line is so strong here, when you went in a different direction, I got confused. I thought I had it straightened out in my head, but then you are taking about both the north and south side of Eight Mile, and my head hurt. So I’m not sure whether another person on the team wrote the headline, but to me, it didn’t work that well and muddled an otherwise good story. Hey Chris, thanks for reaching out. I am not sure what you mean by the first part of your comment. Some residents believe, as you said, that the city can come back or make a comeback. 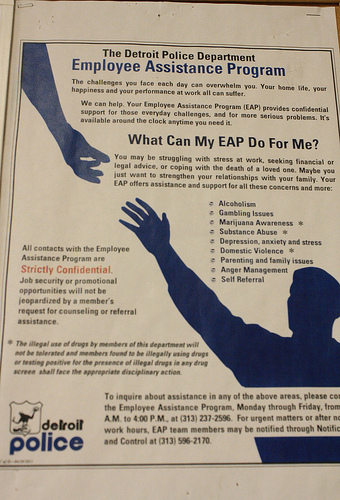 However there are also those who have either lost hope or are apathetic to the situation in Detroit. I said hope might be just out of reach, but I also incorporated the viewpoint that there is hope, i.e. I talked about the promise of new developments citywide. I am aware that East vs. West of 8 Mile does not carry the same connotation as South vs. North. 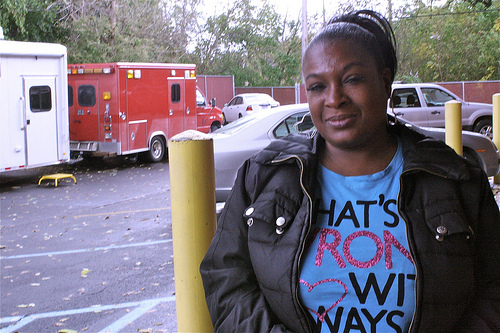 I lined up my interviews from New York; I was under the impression that Shirley from my story was from North of 8 Mile in Hazel Park (the person that introduced us and I had a misunderstanding) So on my final day reporting in Detroit, when I learned Shirley was from Northeast Detroit, I had to do the best I could and tell the story that I had. I wanted to be honest with readers and felt that it was necessary to talk about the North/South divide in my written piece, despite the fact that Byna and Shirley are divided by an East/West boundary. I am sorry if this was not clear. This is an outstanding article to depict the disparities that exist in the City of Detroit from affluent and rundown sections of the city. I believe it is imperative for the residents from Southeastern Michigan to take note of these two outstanding residents in the City of Detroit and take action as they have for so many years. I applaud their hope and perseverance as they join with many of us to work diligently to bring this city back and show outsiders what we as a city and community have to offer. Thank you for coming to Detroit and telling our story of hope!